* The death of Assad on June 10th 2000 shows that Benny Hinn did not know what he was talking about, and is further proof that he is a false prophet, if any more evidence was needed. Note: Because of file size, the best quality files will not always be available. 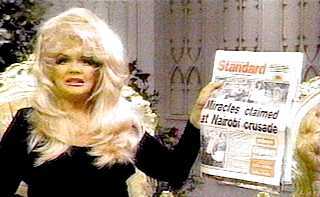 Benny repeated his claim that Jesus will be appearing physically at his crusade(s) about 10 minutes into the 20 April, 2000 This is Your day program. © 2000 Benny Hinn Ministries. 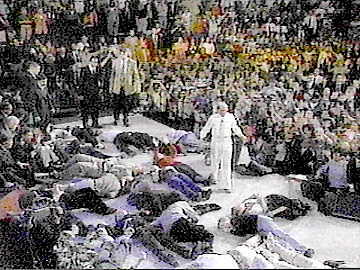 At the beginning of the April 21st, 2000 This Is Your Day program, Benny again repeated his belief that Jesus would appear physically at the Nairobi Crusade: 21 April, 2000. Now, listen to this clip: 02apr2000-clip4 (Real Audio - © 2000 by TBN). 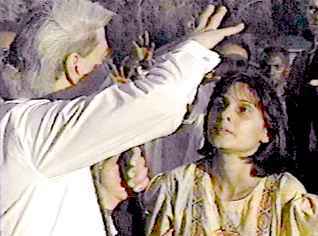 On the 4th and 5th of May 2000, Benny Hinn had as a guest, Dr. D. G. S. Dhinakaran of Jesus Calls ministry in India, who claims to have been to heaven and back multiple times. While in heaven, he claims to have spoken with Jesus, God the Father, and the apostles Peter and Paul. He described the apostle Paul as a short man, and his spirit soul in heaven still bears the marks of his trials and tribulations while on this earth. The soul in heaven, according to Dr. Dhinakaran, retains the outward appearance of the earthly physical body, which he says, is why Moses could be recognized by the apostles at the transfiguration (Matt. 17:3, Mark 9:4, Luke 9:30). A little over a minute and a half into the May 24th / June 8th, 2000, "This is your day" program, Benny Hinn claimed that "fire is falling down from heaven." On the June 12th, 2000 "This is your day" program, Benny Hinn announces that the government of China has given its approval for the "This is your day" program to be aired daily in China, without restrictions, beginning as soon as July 3rd, 2000. China's government has also approved a crusade to be held there by October, and a personal meeting with the Premier of China will be arranged! 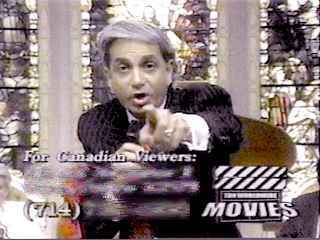 Benny Hinn curses all those who speak against his ministry (Windows media video- 350k). "Yes, Lord, I 'll do it. I place a curse on every man and every woman that will stretch his hand against this anointing. I curse that man who dares to speak a word against this ministry. " More Wolves in Sheep's Clothing!